Microsoft's plans to buy Yahoo's internet search and search advertising businesses have been cleared by both European and US regulators. The European Commission ruled that the deal "would not significantly impede effective competition". Under the deal, Yahoo's website will use Microsoft's Bing search engine, and the two firms will share the revenues. Microsoft is seeking to increase its share of the search engine industry, which is dominated by Google. It and Yahoo first announced the planned tie-up in July of last year. In explaining its decision, the Commission said that taken together, Microsoft and Yahoo currently have less than 10% of the search engine market in Europe, with Google controlling 90%. The Commission said its investigation showed that the deal was expected to "to increase competition in internet search and search advertising by allowing Microsoft to become a stronger competitor to Google". In the US, the deal was also backed on Thursday by the Department of Justice. Microsoft chief executive Steve Ballmer said regulatory approval for the tie-up represented "an exciting milestone". "I believe that together, Microsoft and Yahoo will promote more choice, better value and greater innovation to our customers as well as to advertisers and publishers," he added. Yahoo chief executive Carol Bartz said the two firms would be creating a "breakthrough search alliance". However, technology analyst Chris Green of DMG Europe, said Microsoft had little hope of making much of a dent in Google's search engine dominance. "This deal gives Microsoft a bigger slice of the internet advertising business, but it is still miles and miles behind Google," he said. "Microsoft's Bing is technically a very good search engine, but no-one uses it, and it doesn't currently make a profit. "The deal with Yahoo should turn it into a not-too-shabby and profitable world number two search engine. But still no Google." Under the terms of 10-year Microsoft-Yahoo agreement, Microsoft's Bing search engine will power the Yahoo website, while Yahoo will in turn provide the main advertising sales team for Bing. In exchange, Microsoft will retain 12% of the search engine revenues generated via Yahoo's website for the first five years of the deal, while paying the remaining 88% to Yahoo. Microsoft and Yahoo said they would start to implement the deal "in the coming days". They said they would work with advertisers to make the transition as "efficient and seamless as possible". 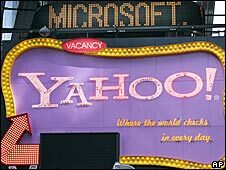 In 2008, Microsoft offered $47.5bn (£30.4bn) to buy the whole of Yahoo, but its bid was turned down.